John Ashe, 61, was pumping iron in his Westchester, New York home when authorities say he dropped a barbell on his own throat, crushing his larynx, according to the local medical examiner, reports CNN. The autopsy report will take around 16 weeks to complete. This report comes as a shock to many, including the U.S. government who believes Ashe to have been complicit in accepting and facilitating more than $1.3 million in bribes from Chinese billionaire business magnate Ng Lap Seng, a major Clinton Foundation donor. Ashe was awaiting trial and was set to testify on his role in the scandal soon. Ashe was amid plea negotiations, according to a letter sent to U.S. District Judge Vernon Broderick last month from Ashe’s lawyer, Jeremy Schneider, which raises suspicion on whether or not his death is in fact an accident or a murder conducted on behalf of associated parties. Ashe was accused last year by United States federal authorities of turning his powerful UN position into a “platform for profit” along with Francis Lorenzo, the ambassador to the UN for the Dominican Republic, who’s been accused of helping Ng pay bribes to Ashe and others political figures in the Caribbean. 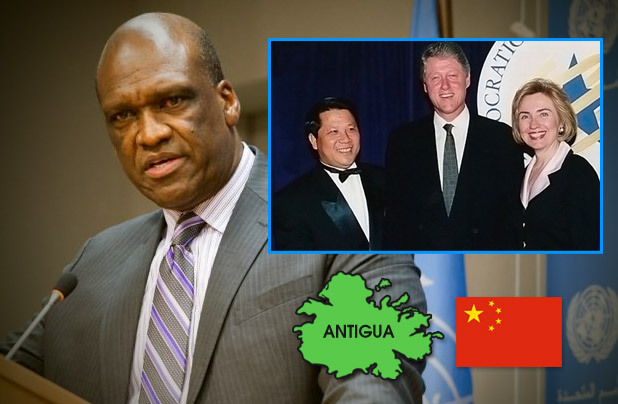 Ng Lan Seng, currently incarcerated in the U.S. on charges of bribery in the John Ashe case, has close ties to the Clinton family and the Democratic National Committee, not only being a major donor to the Clinton Foundation in recent times but also pleading guilty to a felony for illegal contributions to the DNC in a Democratic fund-raising scandal towards the end of Bill Clinton’s presidency and the beginning of Al Gore’s presidential campaign. In 1998, a Senate committee reported Ng, of Macau, China, sent $1.1 million to Little Rock, Arkansas restaurateur, Yah Lin, who in turn contributed hundreds of thousands of dollars to the Democratic National Committee for years on Ng’s behalf. 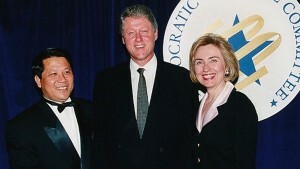 Ng’s relationship with the Clintons is well documented as he had visited the White House 10 times from 1994 to 1996 and had his photograph taken with President Bill Clinton and first lady Hillary Rodham Clinton, as seen in the attached photo from ABC News. Ng was also, according to court papers, served in July 2014 with a subpoena to appear Sept. 17, 2014 in connection with an unrelated investigation, but never showed up. At a bail hearing Saturday, Assistant U.S. Attorney Daniel Richenthal described Yin, a U.S. citizen, as Ng’s right-hand man in his U.S. operations, someone who played a key role in transmitting funds. The prosecutor said Yin spoke to law enforcement after his Saturday arrest, admitting he transmitted money on Ng’s behalf to pay people to do unlawful things, though Yin interrupted the prosecutor, saying: “That is not true,” according to a hearing transcript. Federal Defender Sabrina Shroff, representing Yin, said at the hearing that her client, educated in the United States with family here, may have served as Ng’s “mouthpiece” but the cash and the investments were not Yin’s. “He doesn’t know what Mr. Seng is doing with the money at the end of the day,” Shroff said. Ng’s arrest occurred in September of 2015 and spurred the investigation into John Ashe when authorities discovered Ng had, according to Manhattan federal court papers, smuggled over $4.5 million into the United States over several years with the excuse that he had used the money for gambling and buying paintings from art dealers. According to the New York District Attorney Preet Bharara and the FBI, Ng and Yin were previously arrested on September 19, 2015, based on a separate complaint alleging that Ng agreed to make false statements to Customs and Border Protection officers about the true purpose of the cash that Ng and Yin had brought into the U.S. from China since 2013.